Funeral service Friday, February 3, 2017 at 2pm, St Michael's Church, 220 McPherson St., Princes Hill, 3054. Written by Jill Quirk and Sheila Newman. With the death of Julianne Bell at 5.00 a.m. on Friday, January 27, 2017, environmental activism in Victoria has lost a formidable force and a fearless friend. Julianne was a committed defender of nature and of our right to "keep public land in public hands" through environmental groups such as the Royal Park Protection Group and Protectors of Public Lands, Victoria (which she founded). 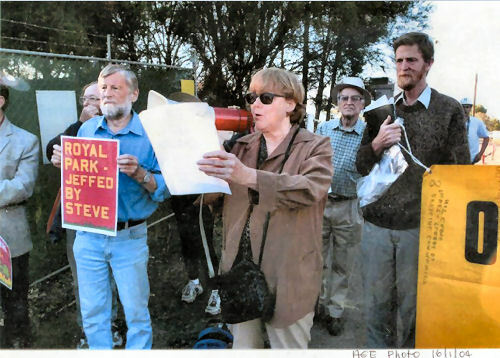 She sternly opposed the encroachment of development on public land, such as the Commonwealth Games Village (a real-estate development which took a large slice of Royal Park and for which 2000 trees were removed). For Julianne her best achievement was the prevention of the construction of the East-West Link, which would have shot through Royal Park in a protracted construction period and gouged a permanent scar. Whilst Julianne by no means did this single handed, her relentless efforts over weeks and months were undoubtedly essential to the eventual victory. As well as being an entertaining and informative raconteur and friend to many, she was a great force for good in Victoria, a defender of nature and the major force protecting public right to public lands in the organisation, Protectors of Public Lands Victoria Inc. Although she was a staunch supporter of refugees and worked for years in a senior position with the Department of Immigration, she well understood the problem of mass immigration and how it contributes to overpopulation in Australia. She was not media-shy, in fact, she cultivated the local media, seeking attention to her issues and would get herself to to wherever reporters and camera were waiting at very short notice, if called upon. She created media events to draw attention to her causes. To Julianne the important thing was not how she was coming across herself, but to communicate her message widely - so vital were her issues to her. 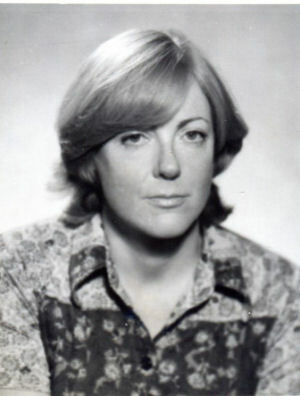 She was well-known to the ABC and The Age and a frequent interviewee on 3CR radio. She was a long-time member of the Labor Party. Julianne was a clever strategist and the power behind many successful campaigns over many years, although she knew the value of a male figurehead in this world where males carry so much more authority. 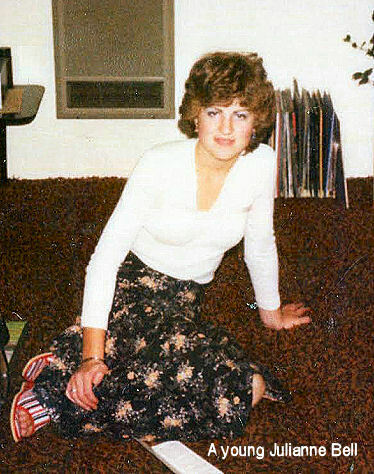 She had friends among QCs, bureaucrats and politicians and commanded respect from members of the police. She would set up a picket-line to define the territory she was defending and she taught others how to defend such pickets. She cared strongly about native animals, native vegetation and the right of Australians to experience nature naturally, without concrete barbecues, bicycle paths and sports fields. She knew how to play bureaucracy at its own game and was capable of stopping arrogant politicians short with technical questions from unexpected angles. She became familiar with important technical aspects of the built environment and their impact on nature and quality of life, such as the effect of industrial scale artificial lighting. She made a point of noting and remembering names, a habit which often proved useful and was always appreciated. Julianne was an important 'lay' politician, but many would not have understood this because she did not have a seat in parliament, although she was often in the gallery and the courts. 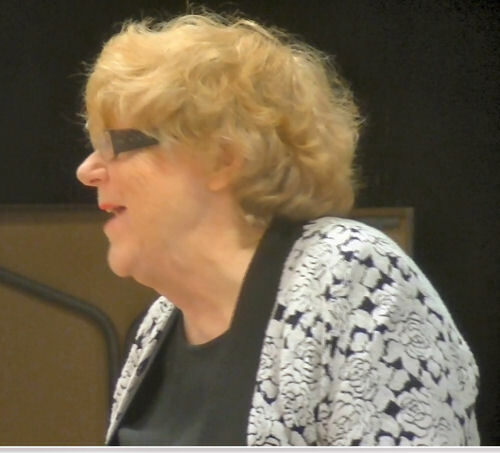 Like many politically active women, she was guided by what needed to be done now, rather than a party agenda, so she fought for policy in the streets and parks, on radio, via the newspapers, holding meetings, writing reports and submissions, teaching others how to do so, trying to protect what our elected politicians should have protected. She was indeed a rare and immensely valuable human being, whose delightful sense of the absurd and merry laugh will be sorely missed. Julianne Bell is an unsung hero, for her activism and vision for Melbourne. She's one of our city's planners who don't become well known from making people wealthy, with support from capital owners! Activists are just dismissed as trouble-makers, alternative and irrational objectors, just populists. Dismissed as NIMBYs. They go under the radar of the mainstream press, without glory that gets attached to great reformists. Activists like Julianne don't seek praise, fortune and fame. They do what they do for integrity, for what's needed against creeping disintegration of our living standards, our natural heritage and destructive forces that pass as "progress"! 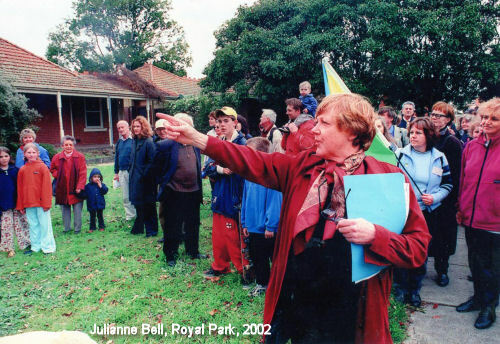 Julianne's passing is a sad loss for Melbourne, who - with others of Protector of Public Lands- fought against the powerful moguls that would destroy parklands, and greenery, in the name of GROWTH - the capitalist ideal. She will be missed, personally and by her team including SPA members - but unfortunately her legacy will not greatly recognised. The Funeral for Julianne Bell will take place on Friday the 3rd Februrary at 2pm. BELL- A funeral service for Julianne Bell will be held at St. Michael’s Anglican Church.220 McPherson Street, Princes Hill on FRIDAY (Feb 3rd,2017) commencing at 2.00p.m. There will be a planting in part of the Circle grasslands in Royal Park. area. It will complete the planting we had in June. Entry is from Gatehouse Street opposite Bayles Street. watch the signs. Parking time limits vary from 1 to 4 hours. Equipment and morning tea provided. All welcome. Do invite your friends. or Chris (Royal Park Officer) 0437925553. The next General Meeting of Royal Park Protection Group will be held on Saturday March 23rd. We are delighted to have Jim Szonyi, Park Ranger to speak to us. The Junior Ranger program is a great favorite with children either through school programs or holiday events. Jim will share details of this program as well as the many other activities that rangers undertake in Royal Park.